Football season is quite possibly our favorite season. And since we don’t live anywhere near our favorite teams (and have unfortunately moved away from where the Big Game is this year! ), we take our at home tailgating, or “homegating,” very seriously. 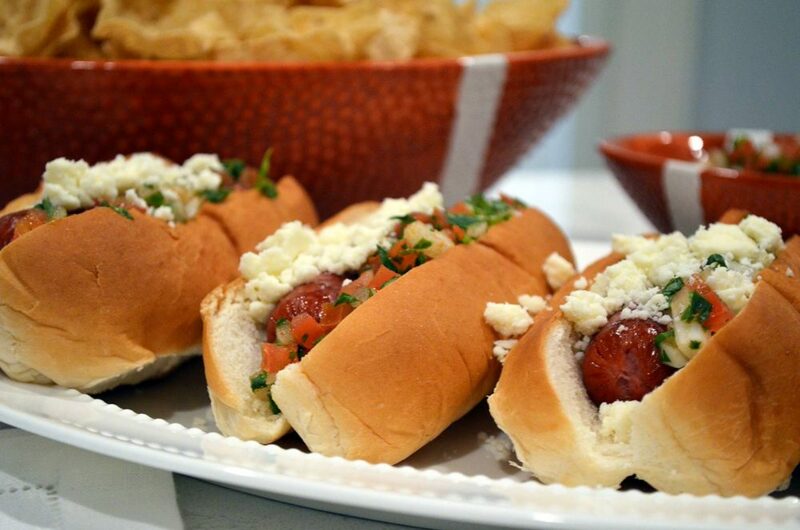 When we plan our at-home tailgates, we’ve got priorities, so we always start with a theme for our food. The food theme has to be something that we are craving but also something we can modify to be kid-friendly too, since our littlest fans are always part of our party! 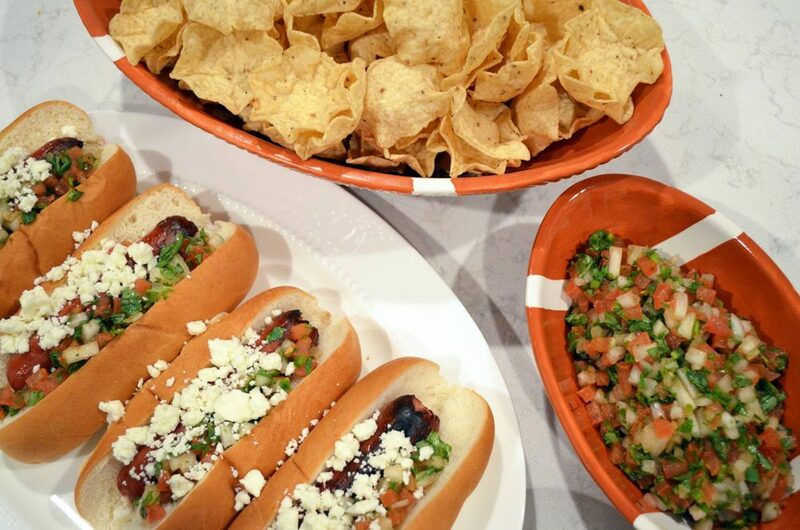 Two things we can never get enough of are Tex Mex and, of course, hot dogs. 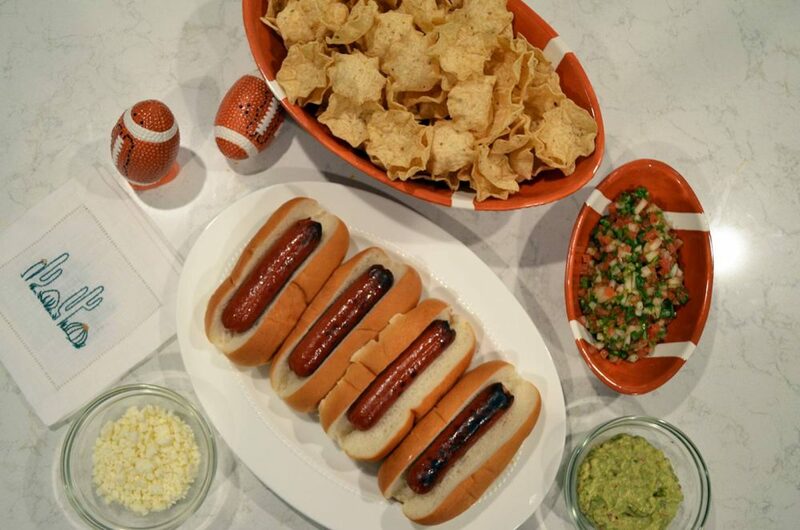 So naturally, in prepping for the Big Game, I set out to find a way to combine the two, and came up with Pico Hot Dogs. This recipe is not only delicious, but it makes your party prep easy by including ingredients that will be able to be used in a few other snacks and dishes. I started out with Ball Park® All-Beef Hot Dogs, which I picked up at Kroger in the refrigerated section. I choose these because they are 100% beef and don’t contain nitrates or artificial preservatives. They also are super juicy and tasty, so they’re great for adding fixings and customizing to your own tastes. Then I made my favorite homemade pico de gallo. This recipe is really fresh and light. 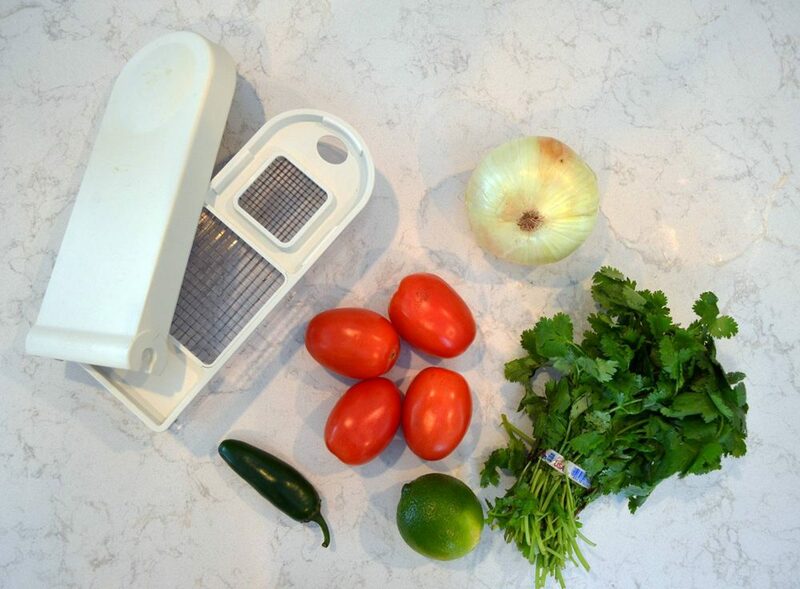 It also makes a huge amount of pico (perfect for a crowd!) and can easily be scaled up, if need be. We always have this around for tailgates because it goes really well with chips, or even on deviled eggs. 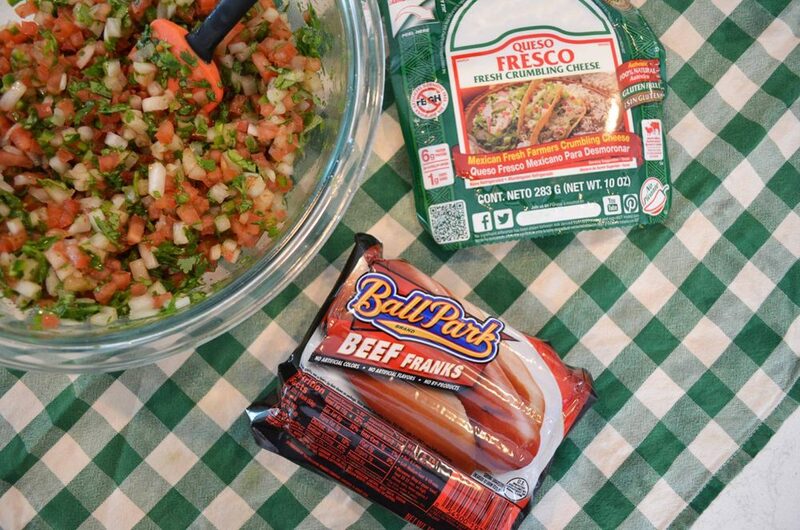 We use this fresh and light pico to top our Ball Park hot dogs, adding a little bit of crumbled queso fresco for even more fresh, Tex Mex flavor. Finish them off with a squeeze of lime juice and you’ve got a light and bright dish that everyone will love. Halve and seed tomatoes. Place each half (cut smaller pieces, if needed) in an alligator cutter to dice. Quarter and slice sweet onion, then dice using the alligator cutter. You want to have equal parts tomato and onion. Halve jalepeno and remove stem, seeds and ribs. Cut into a small dice and add to bowl with tomato and onion. Remove leaves from cilantro and roughly chop. Add cilantro into mixture and stir together. Juice whole lime into the bowl with vegetables. Add both hot sauces and stir well to combine all of the flavors. Taste and adjust seasonings, adding more if needed. For best results, chill for 30 minutes or more before serving. Other modifications for these hot dogs would be topping them with cheesy, melty queso, or even adding some smashed up avocado (my personal favorite!). Serve with some chips, salsa and sour cream and you’ve got a great start to your game day menu. A few additional snacks I’d add to the mix would be jalapeño poppers, wrapped in hickory smoked Wright® Brand Bacon, and some Tequila Lime Tyson® Any’tizers® Wings. You can find Wright brand bacon in the refrigerated section and Tyson Any’Tizers in the frozen section at your local Kroger. These Tyson products add big flavor to any game day spread and there are enough varieties to fit into whatever food theme you may choose. What are some of your game day food favorites? And tell me, who are you rooting for this year? Share your favorites and use the hashtag #fanfoodleague to join the conversation and find some other great recipes! Oh my gosh this entire meal looks so good! My family would love it!! My kind of tailgate! This looks so yummy! These are he best looking jordogs ever! Yum! This is so perfect for a tailgate! Nothing is better than a yummy hotdog! oh yummy these looks so good!!! I gotta try these soon. thanks for sharing. I love game day treats too! Seriously nothing like Sunday afternoon football and food. This looks delicious!! OHHH my heck now I am craving this! game day food is one of my favorites… give me all the wings and hot dogs!!!! Although I have never considered putting Pico de Gallo on hot dogs, I will now! Your hot dogs are cooked perfect for our tastes! We very likely may have these for the big game. I hope it comes down to Atlanta and New England! I love this twist on the classic hot dog! I am definitely going to try it.